Bedrail cap/plug for rear wholes? I have the Husky X-Acts in the rear with the Husky bin, great fit. I have the GM/BORLA and I have zero drone. It is slightly louder than stock, but has a nice non obnoxious growl. It is comparable to the Hemi Ram exhaust. It sounds Fking awesome in other words! I am very happy with it. I have the GM/Borla dual rear exhaust. There is absolutly no drone at any speed. It is slightly louder than the stock exhaust, but has a healthy sound. It is compareable to a Hemi Ram. I am very pleased! 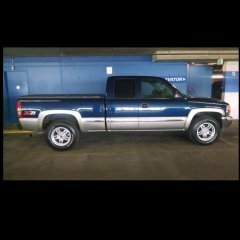 Finally have my truck... is there a break-in mode? plasti dip on 2014 Chevy bowties? how does rough texture look?